We’re well on the journey to Christmas Town where there is a lot of activity happening in the Kindergarten and at home for our children. We’re hearing a lot about Christmas trees, decorating, shopping and baking at home and it’s so wonderful and exciting. We’re carefully pacing ourselves here at school as we still have one more week of school plus our two concerts on Tuesday. 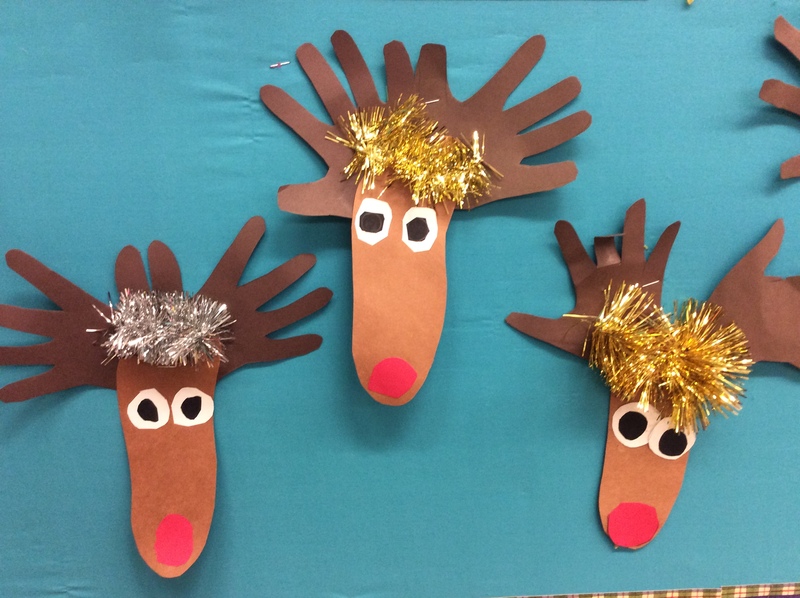 Many children are really enjoying making Christmas crafts and colouring during Centre Time which is very calming and keeps their little hands busy, while others are very content to be looking at Christmas books or playing Lego. One activity everyone looks forward to is listening to Christmas stories. We’re reading the children’s books some have brought in for Sharing, as well as old favourites of ours from our family Christmas book collection. 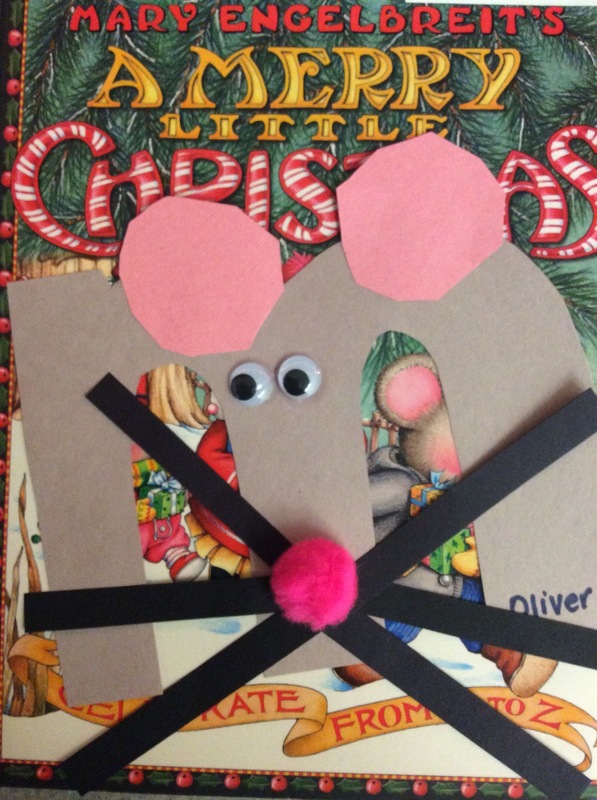 For some great recommendations of Christmas books, click here. We are working hard on vocabulary development with Christmas words and concepts. We talked about how two words can describe the same thing (ornaments/decorations; gift/present), where stockings can be hung (on the fireplace, on your bed), the differences between holly (red berries) and mistletoe (white berries) and what we’re putting on top of the Christmas tree. The children are printing a Christmas word book to go with our discussion. Rehearsals started this week for the Concert and we’re all looking forward to showing off our wonderful singers to you. 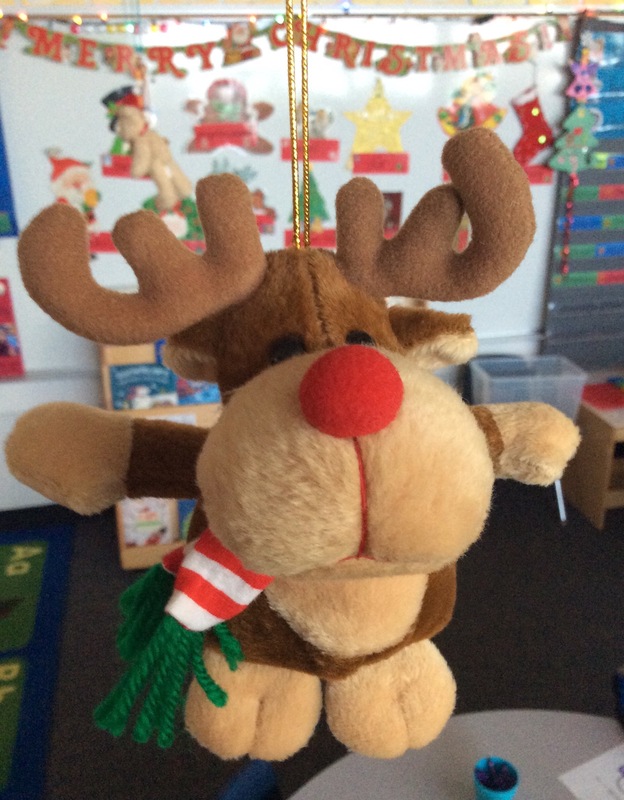 What do you get with 35 Kinders, ten parents helpers and two teachers who are crazy about Christmas? 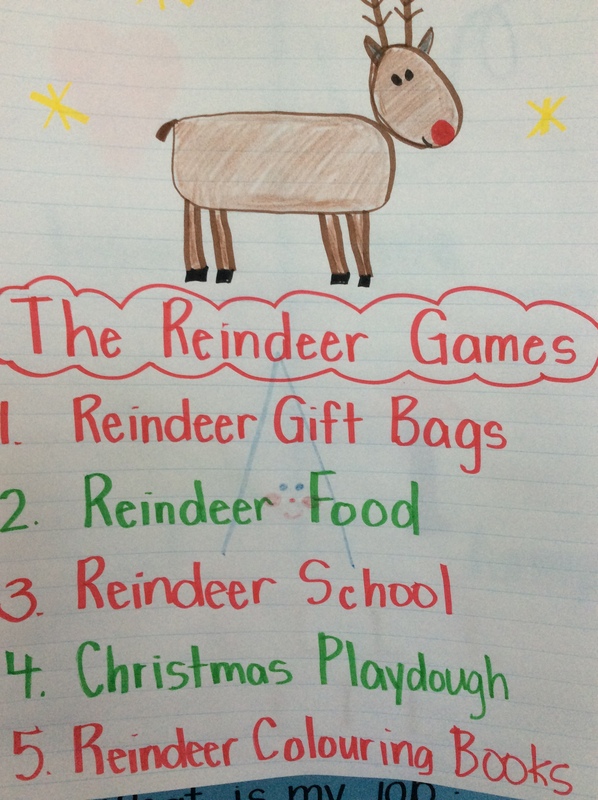 The Reindeer Games, of course! Our big event was held this past Tuesday. Thank you to all the parents who so kindly volunteered for an afternoon at this extremely busy time of year. We’ve written quite a bit about how much fun we have at the Games over the years and this one was no exception. Besides the Christmas fun, the opportunity for our children to come together as a Kindergarten community to play and learn together is an important part of their social development. Many of the children have friends in “the other class” so we want to keep on creating occasions, big and small, to maintain these special connections. For our parent helpers, it’s a great way to connect names and faces for themselves and the children. The children will be bringing most of their crafts home for Christmas; we will keep just a couple of things for their scrapbooks. Tuesday is our matinee and evening performances for the Christmas Concert. We ask that you send your child to school in costume for the day; toques and extra costuming such as the vests we can put on later. Please feel free to drop by the classroom after the matinee performance and see our beautiful decorations before we start taking everything down to send home with your child. We hope you have purchased your tickets for the Christmas Concert. If you need an additional ticket for either show, please speak to us and we will see what we can do! We will have our last library visit before the holidays on Wednesday. Please return your library book. A reminder that classes are dismissed on Friday, December 22 at 12 pm. We will re-open for school on Monday, January 8, 2018.